Bought a brand new 18 MT 07 a few weeks ago and I bought Vortex spools at the dealer since I knew I would be doing maintenance pretty early on e.g. adjust the chain tension today & will do break in service myself. Rear spools are usually easy af to install so I didn't even bother looking at the part. The parts lady just looked it up in her parts book and handed em to me. Now that I'm trying to install them I can't find the spool bosses to install the spools in! Do I actually need to go get a spindle to thread through the axle? Or are there spool bosses I'm missing here? Also if I need to buy a spindle I'm tempted to just return these ones if there's a set out there that comes with the spindle. Pretty miffed at the parts lady for giving me these. And where can I get the spindle or set with spindle? I like this stand way better than anything that uses spools. I just ordered one again. $215 free shipping. I bought a chinese version of this type of adjuster/spool mount. Well made, cheap and works. I drilled the swingarm and threaded a locating screw into the adjuster block so it stays there when the axle is out. The ones that go on the axle itself are problematic when using spools to adjust the chain or remove the rear wheel. A lot of FZ07 riders do end up drilling the swing arms. "A lot of FZ07 riders do end up drilling the swing arms." I considered that and welding in a compression post , but I remember reading tha the steel alloy the swing arm is made from is some proprietary blend and working so in the absence of sufficient info I moved away from that idea. It may be perfectly fine. The lack of real info is what stopped me. The alloy steel drilled and filed similar to a 4130 chromoly... I wouldn't hesitate to tig weld since the factory had no issues mig welding. It's actually not that thin but thin enough that I designed my spindle to go completely thru both sides to spread the load, I regularly sit on the bike with it lifted by the spools. I did chamfer the holes inside and out as per good shop practice. Had I not been worried about burning the paint, I would have welded the inboard end of the spindles to the swing arm but the loctited and lock washered small hex socketed retaining screws are more than adequate. With care and a good technique, the swingarm wouldn't have to be removed to drill thru but I had it off anyway so clamping up in the drill press was easy and kept the holes 90* to swingarm leg. Thanks Cruizin for sharing my earlier post with pix. 35$ shipped! they work great! I've been happy with Gilles AXB chain adjusters with integrated spools. They're a known brand with a good reputation. @bellissimoto hooked me up with them at a good price. 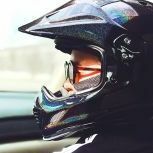 @Carne Seca, I would contact @bellissimoto directly through their website at this link https://www.bellissimoto.com/index.php?route=information/contact. That way you are not waiting for them to visit the forum. still feeling this place out, over on the R1 forum the vendors visit regularly. Most vendors visit fairly regularly and it seems @bellissimoto is here quite a lot, but contacting them directly will be faster and ensure your post is not overlooked amongst all the forum traffic. Yes, I do check the forum regularly, but it's been pretty crazy lately, lol. I'm out of stock at the moment on the Gilles Chain Adfjusters...realistically it'll be about 4 weeks from time to order from when they get here. Thanks everyone! I just ended up returning the spools. I have paddles for my stand that feels sturdy on the swingarm in the absence of spools. I still feel more comfortable with spools though so I'll definitely be looking into the suggestions on this thread. @bellissimoto will get his attention. This notifies him that he was referenced in a post. Will do. I have some on order, but not sure when they will be here. We are getting some Gilles items today in fact, but not sure what is coming in that shipment. Old thread, but always a good topic. I'm very happy with the rear axle spools I got as part of my OES Accessories frame slider kit. They sell different combinations of parts including the rear axle sliders (spools) alone. The link above goes to their page that shows them all. They look pretty sharp too! The OP was asking for spools not just for cleaning but for adjusting. Just wanted to clarify that those won't do it. And one can adjust on spools. I personally do since it's where the bike sits level before putting it back on the ground to check.